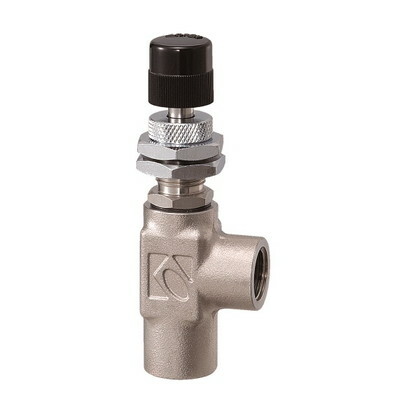 This needle valve has been designed to control minute gas and liquid flows with precision and ease. Design allows the rotation of the regulating screw to transform into linear motion of the needle without subjecting the needle to gaps and/or vibrations produced by the screw, so smooth, stable flows can be ensured. 15 types of needles are available for your choice of the type that best suits your needs. screw is transformed into linear motion of the needle, the valve has a longer life in addition to superior control performance. This temperature compensation system is applicable to gases only, and not to liquids, because the viscosity of a liquid may fluctuate depending upon the temperature conditions. 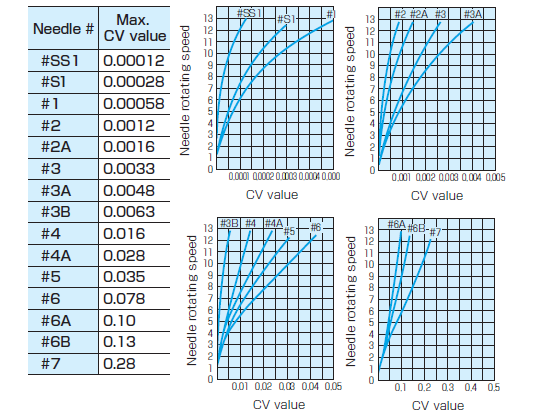 values indicated in this table and those that are actually used by the customer. Please use these values for reference only. • We can suggest you the needle most suitable for your equipment if the pressure, fluid, flow rate and other operating conditions of your equipment are known. Please use the above table for reference only. • Connection openings not included in the standard specifications.